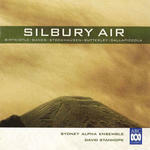 Silbury air / Sydney Alpha Ensemble, David Stanhope. Contents note: Silbury air / Harrison Birtwistle -- Laudes / Nigel Butterley -- Piccola musica notturna / Luigi Dallapiccola -- Sonata da camera / Don Banks -- Kreuzspiel / Karlheinz Stockhausen. Liner notes include programme notes and biographical notes on performers. Performers: Sydney Alpha Ensemble ; David Stanhope (conductor). Capture session: recorded on 1-3 and 30 August 1998 in the Eugene Goossens Hall, ABC Ultimo Centre, Sydney.